Died of wounds on 7th July 1915, aged 18. INSCRIPTION. A BRIGHT YOUNG LIFE SACRIFICED ON THE ALTAR OF DUTY. SO DEARLY LOVED. Son of Harry and Elsie Adelaide Matilda Adams, of Hannay St., Largs Bay, South Australia. Native of Alberton, South Australia. 18th May 1915, aged 23. INSCRIPTION. ELDEST SON OF W.H.& F.B.ALLARD BRIGHTON, VICTORIA. Son of William Henry Allard and Florence Benson Allard, of "Mosslyn," North Rd., Brighton, Victoria. Native of Elsternwick, Victoria, Australia. 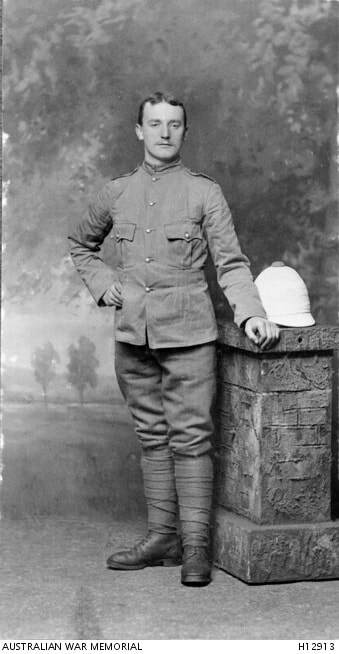 Studio portrait of 73 Private Alfred Donald Macallister Allard, 10th Battalion from Brighton, Victoria. A 23 year old engineer prior to enlisting on 19 August 1914, he embarked for overseas with F Company from Adelaide, South Australia on 20 October 1914 aboard HMAT Ascanius. 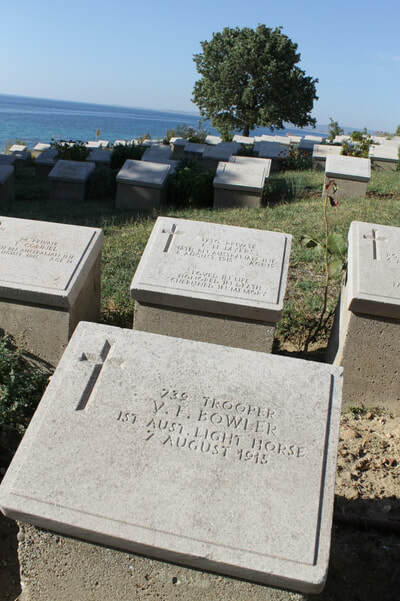 He was killed in action at Gallipoli on 18 May 1915 and is buried in Beach Cemetery, Gallipoli, Turkey. Son of Samuel and Sarah Allen. Native of Fenton, Staffs, England. 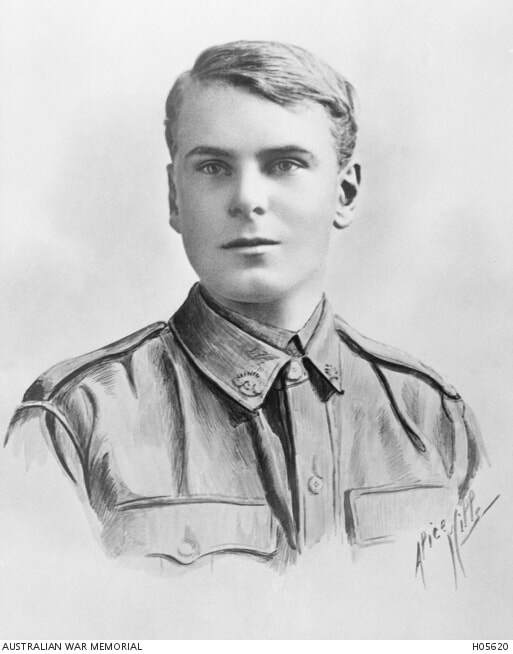 Portrait of Lieutenant Henry Allen of the 3rd Battalion AIF who died from wounds received during an attack on Lone Pine, Gallipoli, on 7 August 1915. Killed in action on 11th May 1915, aged 20. INSCRIPTION. THY WILL BE DONE. Son of Georgina Arthur, of 43, Tranmere Avenue, Murrumbeena, Victoria, Australia, and the late Thomas Perriam Arthur. Native of Yarragon, Gippsland, Victoria, Australia. His brother Thomas Perriam Arthur also fell and is buried in Contay British Cemetery, Somme in France. 7th May 1915, aged 27. Son of Edward and Mary Charlotte Bage. Native of St. Kilda, Melbourne, Australia. Portrait of Lieutenant Edward Frederic Robert Bage, 3rd Field Company Australian Engineers, of St Kilda East, Vic. Highly gifted, Edward Bage matriculated at age 14 and trained as a civil engineer and a surveyor. He took part in Douglas Mawson's Australasian Antarctic Expedition (1911-1914) as astronomer, assistant magnetician and recorder of tides. When Mawson and his companions failed to return to winter quarters at the expected time, Bage volunteered for a relief party of six that remained in the Antarctic for a second winter. 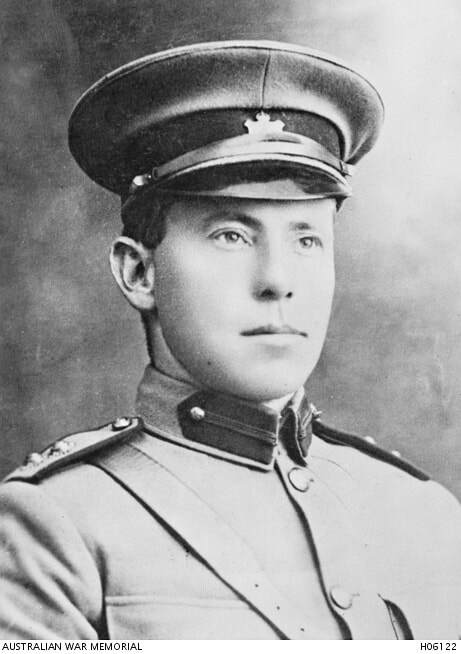 He led a party on a dangerous 1000 km journey hauling sleds over the ice and was awarded the King's Polar Medal in 1915. Enlisting in August 1914 as second in command of the 3rd Field Company of Engineers, Captain Bage took part in the landing at Gallipoli. While marking out a trench line near Lone Pine on 7 May 1915, he and his companions came under fire from five Turkish machine guns and he was killed. 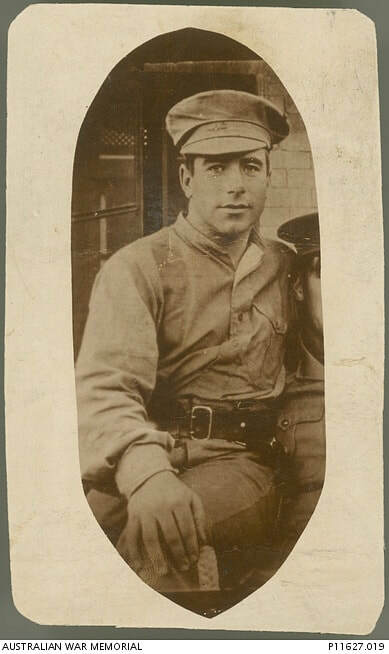 Studio portrait of 856 Private (Pte) Alfred Bailes, labourer, of Donald, Victoria. He enlisted in the 4th Light Horse Regiment on 9 November 1914 and embarked from Melbourne aboard HMAT Wiltshire on 13 April 1915 for Gallipoli. 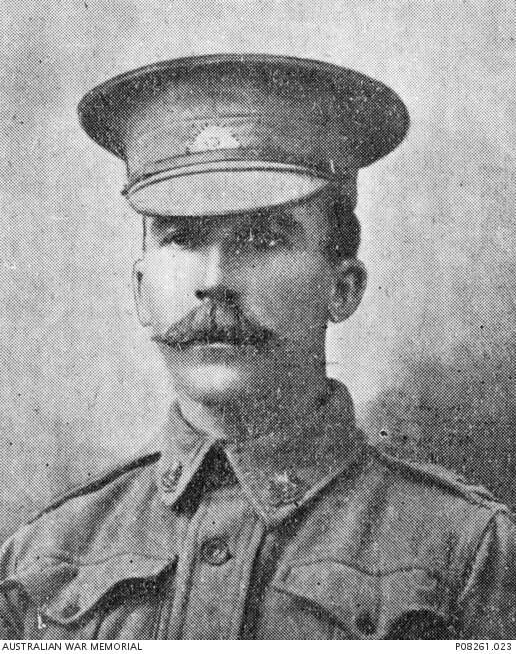 Pte Bailes was wounded in action at Gaba Tepe, Gallipoli on 7 August 1915 and died of these wounds the following day. He was aged 28 years. This image is one from a poster produced at Donald, Victoria, commemorating the deaths of soldiers associated with Donald and surrounding district during the First World War. The poster is held at P08261.001. 7th August 1915, aged 29. INSCRIPTION. IN MEMORY OF THE DEARLY LOVED SON OF MR. & MRS.BEATH. MALVERN, AUST. Son of George James and Annie Maria Beath, of 11, Carnarvon Rd., Malvern, Victoria, Australia. Native of Prahran, Victoria. 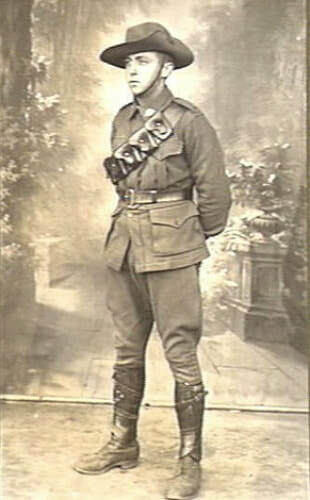 Portrait of 4013 Gunner (Gnr) Thomas Herbert Beath, 2nd Field Artillery Brigade. A civil engineer prior to enlistment, he embarked on HMAT Shropshire on 20 March 1915 for the Dardenelles where he joined the 4th Battery on 25 July 1915. Gnr Beath was killed in action on 7 August 1915, aged 29 years. 1st Australian Light Horse Regiment, A.I.F. 07th August 1915, aged 21. Remembered by Christopher Albertson and Mr David Bowler. Val was David's great uncle. Valentine Fennell Bowler was born in 1894 on Annandayle Station, the family property near Holbrook, Germanton, New South Wales to parents Samuel Patrick and Mary Catherine Bowler (nee Fallon). Val, as he was known, was the second eldest of six boys, with an elder brother John and younger brothers Harold, Samuel, Cyril and Kenneth. Sadly his father Samuel died in 1903, when Val was just eight years old. Val attended St Ignatius Catholic College in Riverview, Sydney and obtained rural training at Wagga Wagga Experimental Farm. At the time of his enlistment he was a grazier on the family station and had also previously served one year of compulsory service with the 44th Infantry. 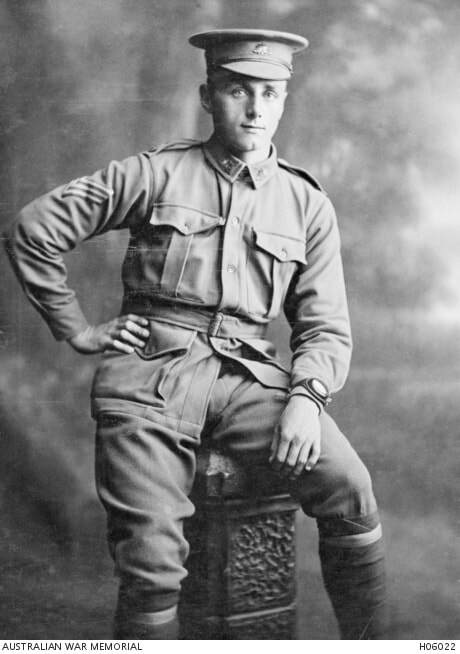 Val successfully enlisted in the AIF in Liverpool on January 27th 1915 by increasing his age to 22, although he was only 20 at the time. He was posted to the 2nd Reinforcements to the 1st Australian Light Horse Regiment with the rank of Trooper, and embarked from Sydney aboard HMAT Anglo-Egyptian on February 8th. He saw war service in Egypt prior to being sent to Gallipoli, where his regiment relieved the 2nd Light Horse at Pope’s Post. His younger brother Harold also put his age up to enlist. Val was taken on strength at Gallipoli with the 1st Light Horse Regiment from his 2nd Reinforcements on July 15th 1915, and on August 3rd the 1st Light Horse began relieving the 2nd Light Horse at Pope’s Post. On August 7th the 1st Light Horse attacked the Turkish trenches opposite Pope’s Hill in support of the major attack by the 3rd Light Horse at the Nek. This support attack was at a great human cost to his regiment with 27 dead, 99 wounded and 32 missing officers and men, however Charles Bean records the number of casualties as 154 from an original attacking party of 200. Val was killed on August 7th 1915 by a sniper whilst on sentry duty following the day’s strong fighting. Of his death, Private Walter John Hudson wrote, “At about 9.50 on the night of the 7th August, Bowler told me he was feeling ill – generally run down. At about 10 oclock, myself and Bowler went to our posts in the trench at Pope’s Hill, the two posts being within 20 yards of each other. Within a few minutes Bowler was shot through the head…” Val was taken to the Casualty Clearing Station where Private John Francis “Frank” Purtell, a mate of his, stayed with him until he passed away around two hours later. Frank later gave Val’s kit to his brother Harold, who served in the 12th Light Horse Regiment before being transferred to the 5th Field Artillery Brigade. Like Val, Frank was born in Holbrook and they possibly knew each other prior to both being posted to the 2nd Reinforcements to the 1st Australian Light Horse Regiment, where they embarked together and fought together at Gallipoli, where Val was killed. 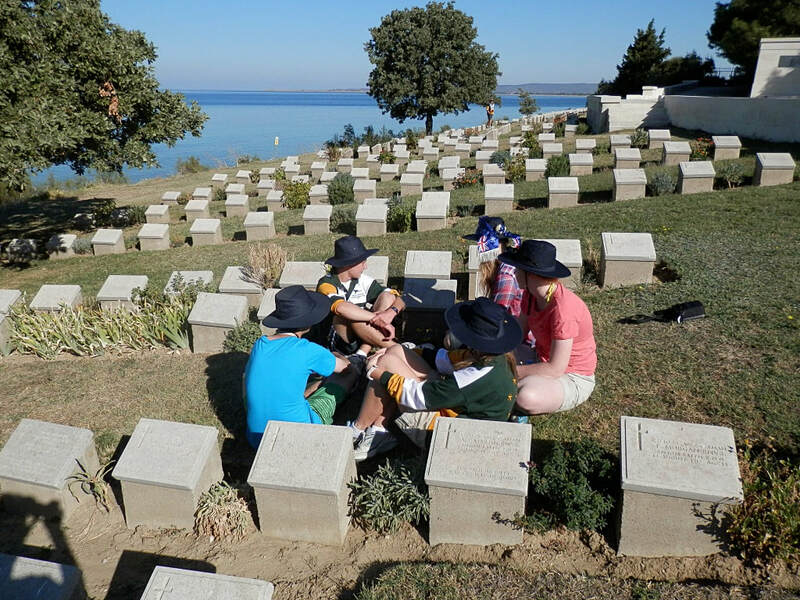 Val was buried at Beach Cemetery on the southern point of ANZAC Cove the following day by Chaplain Reverend McPhee. He was just 21 years old. Val’s brother Harold survived the war and at the time of his discharge was in training as a flying officer pilot with the rank of Second Lieutenant on probation with No. 6 Training Squadron, Australian Flying Corps. Son of Frederick and Ellen Doidge Braund. Native of England. Studio portrait of Lieutenant Colonel (Lt Col) George Frederick Braund, VD, Commanding Officer of the 2nd Battalion. Braund was killed on 4 May 1915; he was accidentally killed by an Australian sentry when he failed to respond to the sentry's challenge. Lt Col Braund came from Neutral Bay in Sydney and was a Member of the NSW Legislative Assembly for Armidale. Prior to enlisting on 17 August 1914 he served with the 13th Infantry, Citizens Military Forces. Lt Col Braund embarked from Sydney with the Headquarters Section aboard HMAT Suffolk on 18 October 1914. Died between 6th August 1915 and 8th August 1915, aged 39. INSCRIPTION. FOR KING AND COUNTRY HE LAID DOWN HIS LIFE. Son of Ernest Samuel and Alison Brown; husband of Hannah Brown, of "Royston," Helen St., Artarmon, Sydney, New South Wales. Native of Yorkshire, England. 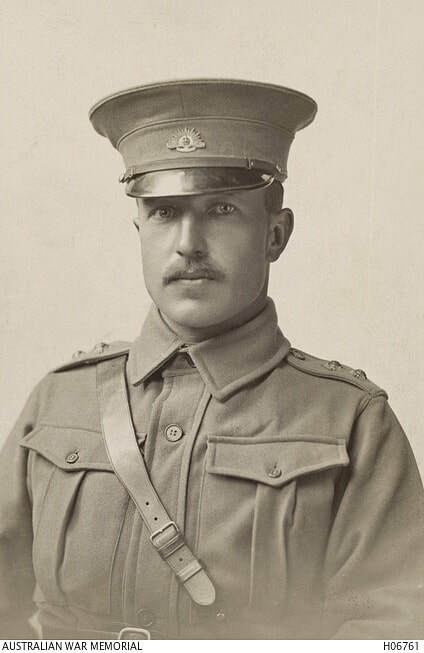 Studio portrait of Lieutenant Colonel (Lt Col) Ernest Samuel Brown, 3rd Battalion. 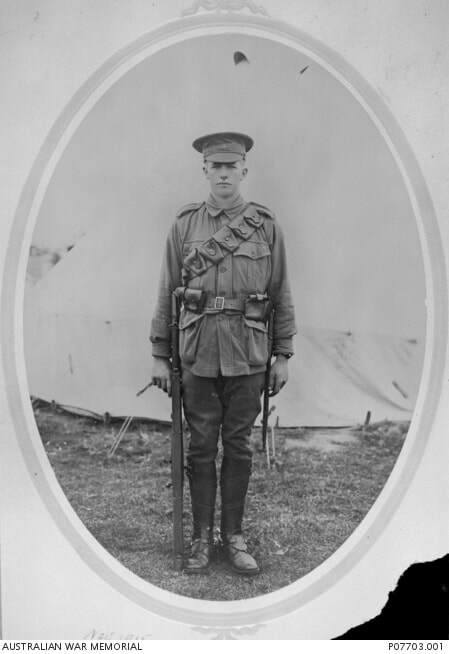 A professional soldier from Haberfield, New South Wales, he held the rank of Captain in the militia prior to the outbreak of war and was commissioned in the 3rd Battalion. He embarked from Sydney aboard HMAT Euripides on 20 October 1914 for Egypt. He was promoted to Major on 1 January 1915 and then participated in the landing at Gallipoli where he received a Mention in Despatches by General Sir Ian Hamilton for acts of conspicuous gallantry or valuable service during the period 25 April to 5 May 1915. On 5 May 195 he was promoted to Lt Col and transferred to temporarily command the 2nd Battalion and was wounded in action two days later but returned to duty. On 19 July 1915 he was appointed to temporary command of the 3rd Battalion. 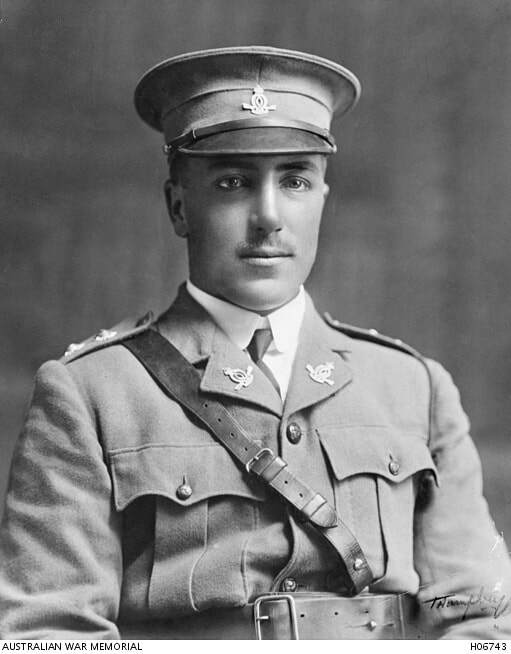 Lt Col Brown was killed in action at Lone Pine, Gallipoli, on 6-8 August 1915. He was aged 39 years. 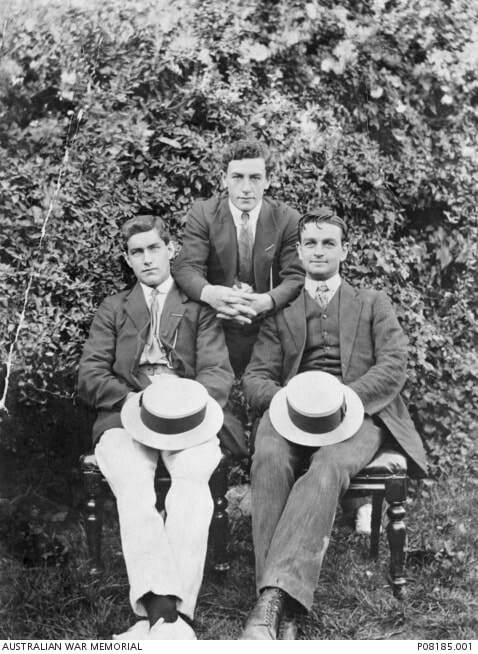 Informal pre-enlistment portrait of 648 Lance Corporal (L/Cpl) Harold Heathcote Hayes Chambers (centre), 7th Battalion, of Kyneton, Vic, and two men one of whom is called Ray. He was a draper prior to enlisting on 18 August 1914. Promoted to Lance Corporal the very next day, he embarked from Melbourne on board HMAT (A20) Horarata on 19 October 1914. 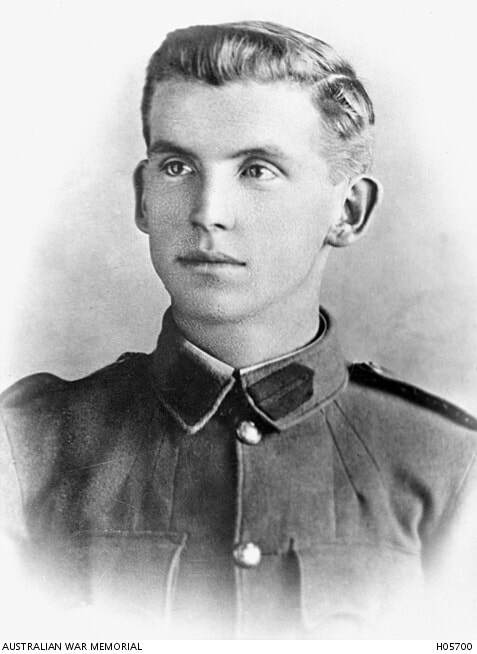 L/Cpl Chambers was wounded in action during the landing at Anzac Cove on 25 April 1915 and died of his wounds on 28 April 1915. He was 21 years of age. Lancelot Fox Clarke, D. S. O. 12th Bn. Australian Infantry, A. I. F.
25th April 1915, aged 57. INSCRIPTION. SANS PEUR ET SANS REP ROCHE. Son of the late Joseph Johnston Clarke and Charlotte Elizabeth Clarke; husband of Beatrice Fox Clarke, of Holebrook, Tasmania. Native of Melbourne, Australia. Studio portrait of Colonel Lancelot Fox Clarke DSO VD of the 12th Battalion, AIF. He was killed in action on 25 April 1915 at the Gallipoli peninsula, aged 57. One of the inspiring figures in the early hours of the landing at Anzac was the 57-year-old commanding officer of the 12th Battalion, 'a brave and gallant gentleman'. He landed in a boat brought in by HMS Ribble. Once ashore, he recognised there was no time to waste. He sent a platoon to silence an enemy machine-gun then led his men up the hills. When reminded that these were not the orders he had been given, he replied firmly, 'I can't help that'. 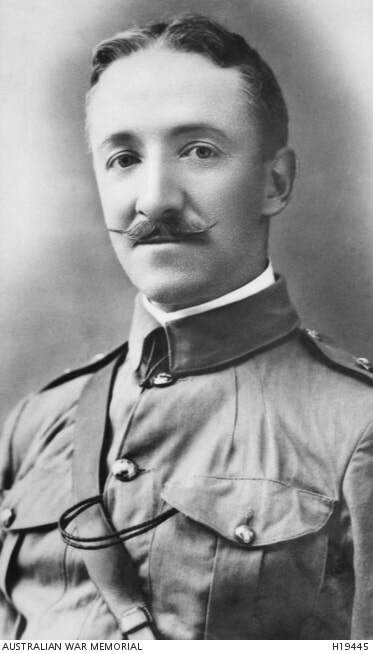 Clarke was the oldest battalion commander of the force; he had been decorated in the Boer War. 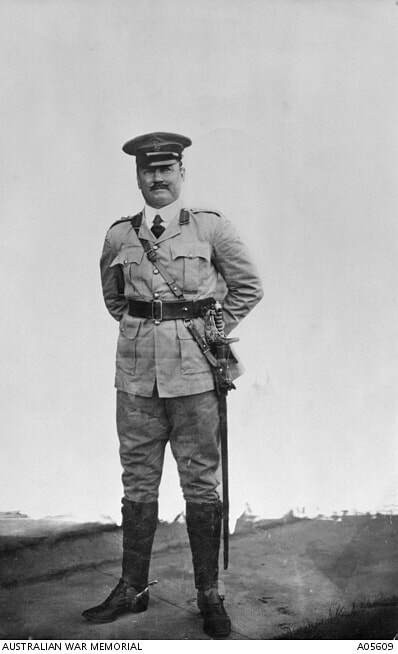 On Gallipoli, men looking for leadership were drawn to him. The climb up from the beach exhausted Clarke, but he got there with the rest of his men. On the ridge the colonel coolly took command: 'Steady, you fellows! Get into some sort of formation and clear the bush as you go.' Reaching the Nek, he was anxious to get information back to Sinclair-MacLagan, the covering force commander. While standing, writing in his message book, he was shot, and fell with the pencil in one hand and the book in the other. Died between 7th August 1915 and 12th August 1915, aged 21. INSCRIPTION FOR KING & COUNTRY HE GAVE HIS LIFE, A HERO IN THE DEADLY STRIFE. Son of Daniel and Esther Collins, of "Ypres," 64, Chandos St., Ashfield, Sydney, New South Wales. 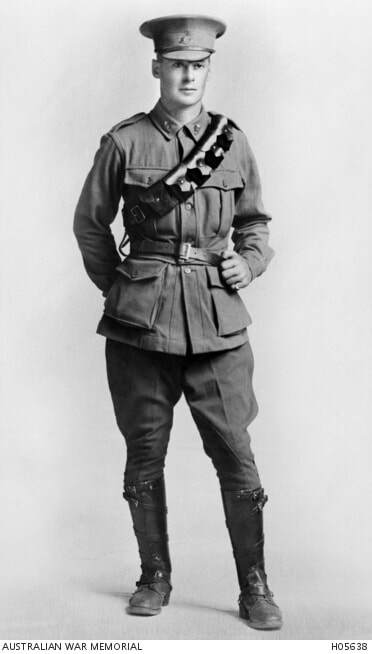 Studio portrait of 62 Sergeant (Sgt) Leslie Collins, 3rd Battalion from Ashfield, NSW wearing his Militia uniform. 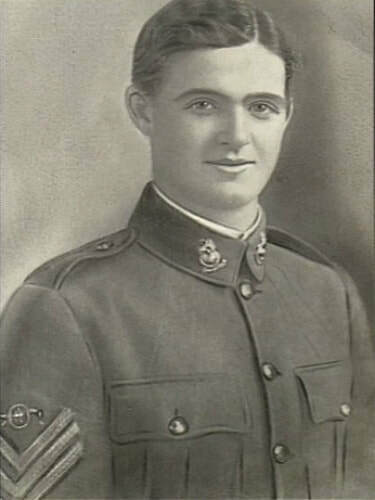 A 20 year old packer prior to enlisting in the AIF on 17 August 1914, he embarked for overseas with the Machine Gun Section from Sydney on 20 October 1914 aboard HMAT Euripides. Within five days after landing at Gallipoli, he had been wounded in action and evacuated back to Egypt for medical treatment. On recovering, he rejoined the battalion at Gallipoli on 25 July and was killed in action at Lone Pine between 7 and 12 August 1915. Sgt Collins is buried in the Beach Cemetery, Gallipoli, Turkey. 8th Bn. Australian Infantry, A. I. F.
Portrait of Lieutenant (Lt) Alan Crawford (Dutch or Dutchy) Couve, 8th Battalion from Dandenong, Victoria. A 20 year old chemist’s apprentice prior to being appointed a Second Lieutenant on 24 August 1914, he embarked for overseas with G Company from Melbourne on 19 October 1914 aboard HMAT Benalla (A24). 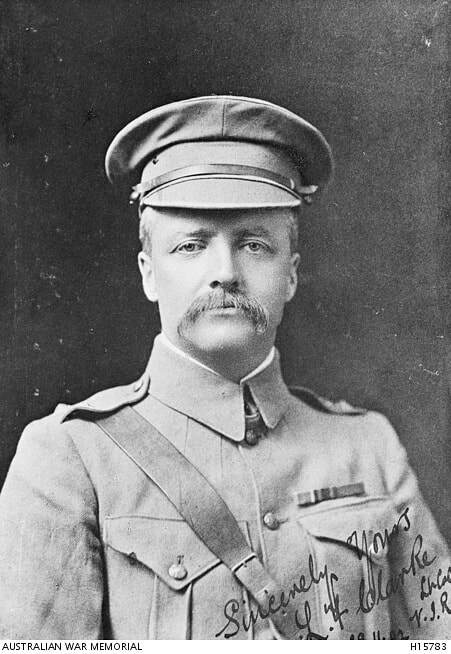 After a stopover in Albany, Western Australia, he arrived in Egypt on 2 December 1914. Following further training in Egypt, the battalion took part in the Gallipoli landings on 25 April as part of the second wave. Lt Couve was wounded in action on the first day and died from his wounds on 26 April 1915. He is buried in Beach Cemetery, Gallipoli, Turkey. This image is from the collection of brothers Lt Alan Crawford Couve and 2nd Lt Henry Thomas Ladson Couve from Dandenong, Victoria. They photographed members of their unit in Egypt prior to serving at Gallipoli where they both died. Killed in action on 9th May 1915. 12th May 1915, aged 22. INSCRIPTION. HE GIVETH HIS BELOVED SLEEP. Son of Arthur and Eliza Dawkins, of Rowell Avenue, Camberwell, Victoria, Australia. Native of Rochester, Victoria, Australia. Studio portrait of Lieutenant (Lt) William Henry Dawkins, 2nd Field Company Engineers, of Ferntree Gully, Vic. A military student prior to enlistment, Lt Dawkins embarked from Melbourne on HMAT Orvieto on 21st October 1914. 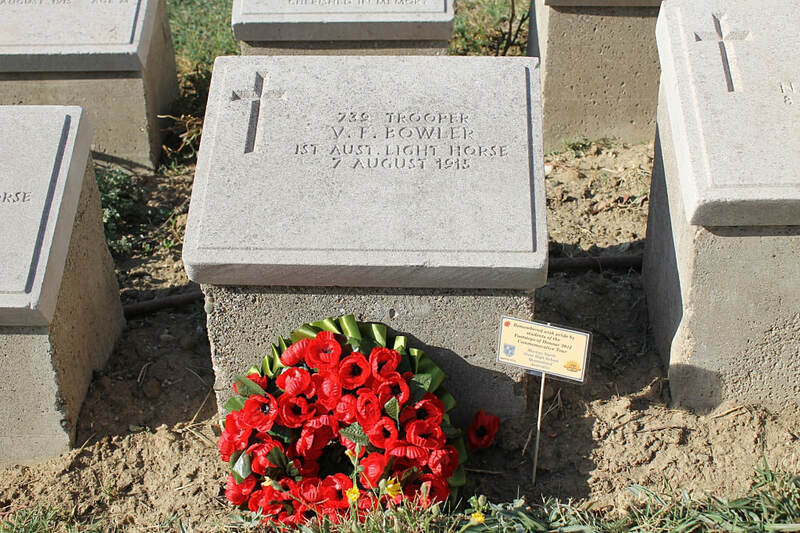 He was killed in action at Gallipoli on 20th May 1915 and was buried in the Beach Cemetery at Anzac Cove. INSCRIPTION. GOD & HIS COUNTRY NEEDED HIM. Son of Francis and Alice Gordon Fox, of "Ione," Naples Rd., Mentone, Victoria, Australia. Native of Melbourne, Australia. His brother Charles Joseph Fox also fell.